‘Chiang Mai Treasures’ or ‘Treasures of Chiang Mai’ is a 3 day cycling adventure through Doi Saket – San Kamphaeng – Bo Sang – Chiang Mai. The excursion is a well planned route, on peaceful roads and through beautiful parks. Participants are taken to areas where it looks like time stood still. Chiang Mai Treasures gives you an absolute unforgettable experience, to remember and look back on with pleasure for a lifetime. The excursion starts at 09:00am from our office Baan Nai Fan 1, Chiang Mai. The first surprise awaits us only 30 minutes away. Together with our bicycles we board a boat at the Ping River that brings us to the northern part of Chiang Mai. Here we get back on dry land at a farmhouse, where we have fruit juice, before continuing our cycling trip. The first day brings us to the country side of Chiang Mai province and we see different kinds of agricultural activities. The route goes along the rice fields, passing by beautiful temples. Throughout the whole day we enjoy the ever changing scenery. Before we arrive at our resort, we pass the Mae Kuang Dam, take a short break, and enjoy the beautiful view. On the second day we cycle from Doi Saket to San Kamphaeng . Along the way we visit a Chinese cemetery and Doi Saket temple, located at the top of the hill. This temple is the social centre of the village and has activities almost all the time. The trip continues over country roads and we make a stop at the San Kamphaeng hotsprings where we also have lunch. After lunch, we continue our journey through the rice fields and small villages, where most of the people work with wood and metal handicrafts. Of course we stop to take some pictures, and provide you with more information. At night we stay in a Lanna style resort, where you can get a real Thai massage at a reasonable price. Day 3 and the last day of Chiang Mai Treasures, we cycle from San Kamphaeng through Bo Sang back to Chiang Mai. Along the way we stop at a small candle factory where you can try your artistic skills by making your own personally designed candle. We have lunch in Bo Sang where you can also walk around and take a look at a rice paper factory. The last stop is at a local market where we you can taste different kinds of fruit and snacks. The excursion ends at around 16:00 hrs at our office. 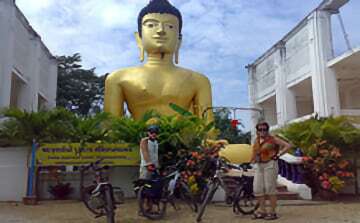 Chiang Mai Paradise is a one day cycling adventure through the South-Eastern part of Chiang Mai.